Fantasy books are often set in a more primitive world where the chance of having a hot shower is minimal and toothbrushes possibly not invented. Likewise, in space, water is at a premium, needing to be recycled over and over. In both scenarios, the issue of bodily odours and hygiene can be ignored by the writer as something not of great importance. Yet these are the sorts of details – smells, itches, blood, sweat and dirt – that drag the reader into the story, sympathising with your characters and creating a very real world. For a fantasy setting that is a quasi Earth, then looking to medieval times for scented herbs and earlier to the Romans for hygiene tools would be something to add to the story. Jean Auel in her ‘Earth Children’ series makes much of herbs for cleansing, using soapwort roots pounded into a mash to create a foamy lather to wash hair. Difficult as it might be to identify and gather soapwort (which is still used as a gentle cleansing agent for ancient tapestries) the alternate she offers is not for the squeamish. Her character uses stale urine to wash her hair, the ammoniacal fluid removing headlice and grease. One hopes a good rinse would get rid of the smell. Lemon juice can also be used to clean the hair. Other washing agents for hair and body could be a floral scented herbal vinegar. Herbal vinegars are easy to make if you would like to experiment with scents – white vinegar in a glass jar with a plastic lid and infuse flowers such as rose, lavender and jasmine or more manly ones of bay and rosemary. Leave in a warm place, changing the flowers until the sent is strong enough, straining at the end. Herbal teas using rosemary or chamomile could also be used to wash and freshen up. The Romans used to rub oil onto their skin, then scrape it off with a small metal tool (a strigil, pictured) before having a good bath. More northern snow bound countries had sweat baths or saunas set up, where pine needles could provide a nice scent, and then a brisk roll in the snow to make you feel alive. For teeth cleaning, sage leaves offer a good rough surface to rub over your teeth, as well as chewing parsley or mint. Of course, sugar was not invented or not available, and this has a great effect on cavities- ancient Pompeiian bodies had excellent teeth. However, some Neanderthal teeth show evidence of treated abscesses, so I guess it varies. For science fiction, the confines of a space suit or ship would I imagine tend to get pretty rank. 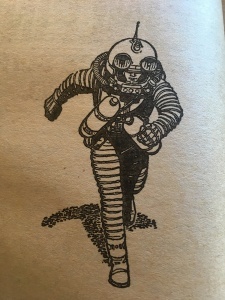 Robert Heinlein in his book ‘Have spacesuit, will travel’ makes much of the odour of old socks and garlic of the suit, and the efforts to disinfect it. In Andre Norton’s book on the traders, often they trade in aromatic woods and costly spices from alien planets, and this forms a basis for trade and is an integral part of her world building. The deodorising, shaving and drying cabinets in Harry Harrisons ‘Stainless Steel Rat’ are an attractive feature in the future of showers. Another aspect of smell in science fiction is the perception of it by different species. One aliens rubbish pile might be other aliens aphrodisiac! This would have some profound and potentially disastrous effects on contact and diplomacy between species. Travel to other countries is often an assault on the senses – different smells, tastes and sounds. What one accepts, another may take offence. Using these aspects of real life in your book will help the reader identify with the character, and it is a good chance to introduce humour or unexpected drama. Take the reader into a different world by all means, yet give them a tool to understand what it is really like to live there. Enjoy this blog? Have a think about signing up via my website or catch them as they fly around the ether on twitter or facebook. They will stay where they are pinned on pinterest. 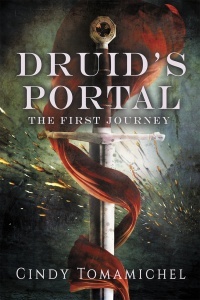 For those that like time travel romance – or historical fantasy – or a page turning action adventure – Druid’s Portal has been described as a book you can’t put down. Join archaeologist Janet and Roman soldier Trajan on an adventure with plenty of barbarian fighting, ancient goddesses and druids. It’s not your typical romance, but it will set your heart racing! I do my best to keep things realistic, while also keeping the story moving forward. I have varying degrees of success. Another teeth hygiene from back in the day, Vikings used charcoal to clean their teeth. They had some of the healthiest teeth around. I had forgotten about charcoal, good point – and it would have a beneficial effect on the digestion as well. Thanks for reading. I often find high action books where no one eats or sleeps for days, which takes me out of the story. Thanks for reading! Copyright © 2019 Cindy Tomamichel. Powered by WordPress. Theme: Spacious by ThemeGrill.